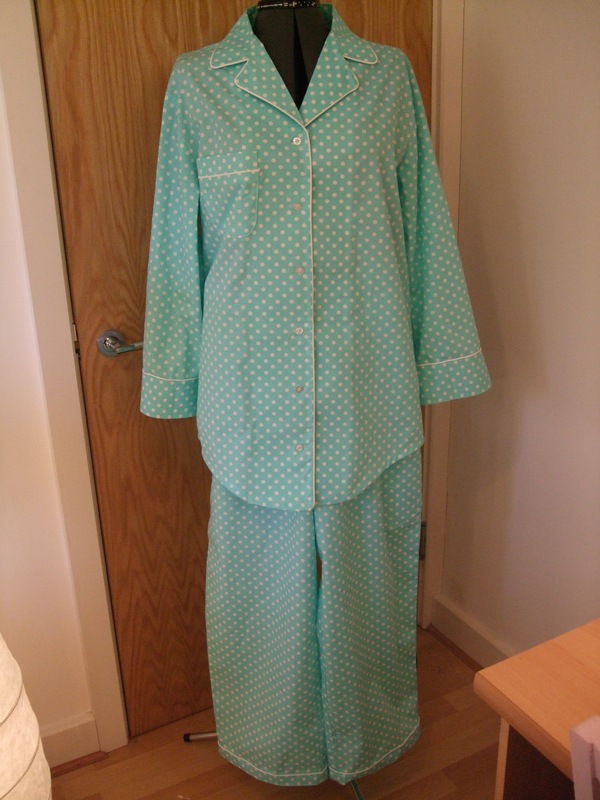 Yesterday I finished making my first set of pyjamas – not for myself, but as a Christmas present for my mother-in-law. There are many pyjama patterns available: the reason I chose this one was a) I was already ordering some other Simplicity patterns, b) it’s a unisex pattern and c) I liked the variations, particularly the nightshirt which I envisaged making for myself. I thought it would be nice to give my mother-in-law a home-made gift this year, and mistakenly thought it might also work out cheaper, but it turned out to make the pyjama bottoms and the shirt top, I needed a whopping five metres of fabric, which at £4.99 per metre set me back just under £25. If I factor in the cost of interfacing, bias binding, piping cord, elastic, thread and buttons, I start to panic! 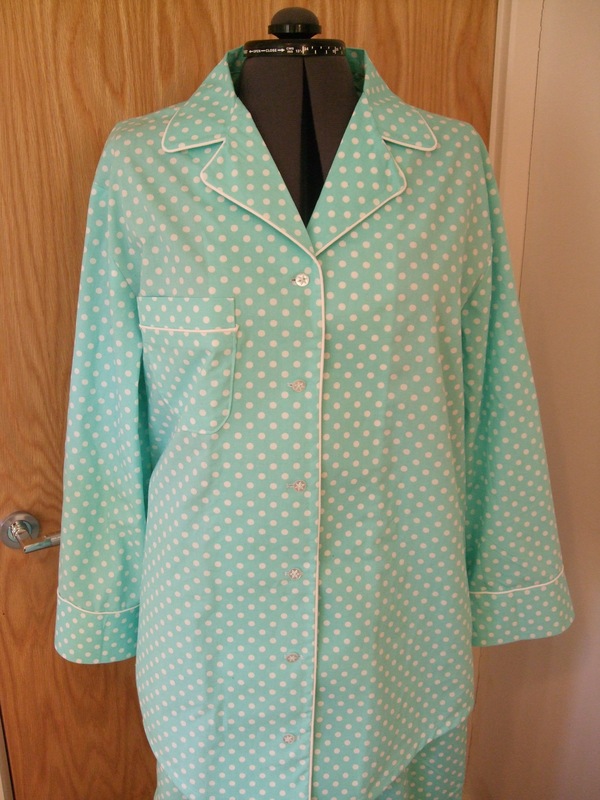 Now, I could have bought cheaper fabric, but I had already asked mother-in-law what sort of fabric she’d like, and what colour, and once I found what she wanted (turquoise polka dot), the only choice that remained for me to make was whether to buy polycotton for half the price, or 100% cotton. I opted for the latter of course, because I wanted to make a quality pair of pyjamas which would feel nice and be comfortable to wear. Sadly, I am not thrilled with this pattern, and although I have made a good job of making the pyjamas, I wouldn’t say I like them that much. The pyjama bottoms were very easy to make, but I think they come up a bit on the small side. Admittedly, my hips (40”) are a little wider than my mother-in-law’s, but judging by the size guide printed on the packet I should still fit a medium (hips 39-41), and whilst I can get them on, they are a bit narrow, which I think is a design fault of the pattern. Pyjama bottoms should be roomy and comfortable, not clingy. Or is it just me?! As for the pyjama top, it is so long! I know I definitely did not make the nightshirt by accident, but it’s certainly longer than a pyjama top needs to be, coming quite a way below the hips. I think it would have been helpful if the pattern included the option to make the shirt with a straight bottom rather than curved, but unless I am completely blind/mad, it did not. If I was to ever make this for myself, I would have to adapt the pattern. I also dislike the cuffs: I think they are too deep for a pyjama top. I’m sure they would look better on the nightshirt variation, however. ← Why my Elna sewing machine is bad… Or, don’t buy an Elna 2007!